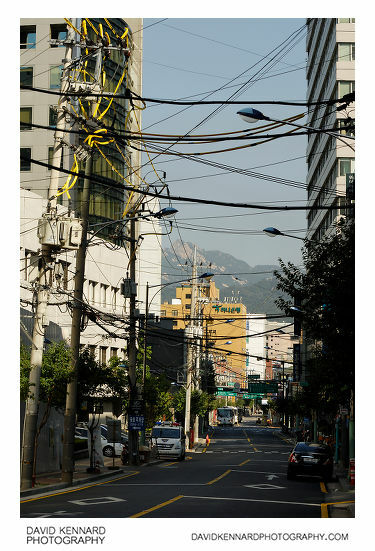 This post is part of a series on the walk we went on on the second day of our Holiday in Seoul, Korea. 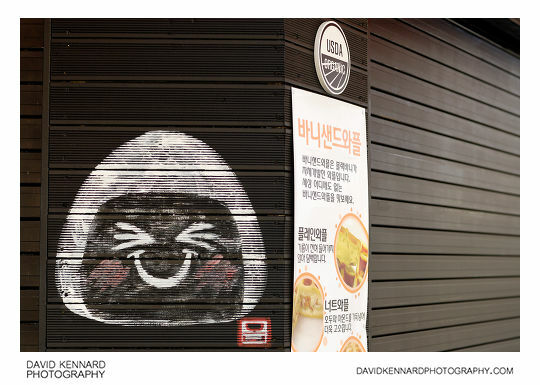 If you haven't read the first part, that's here: Korea day 2 - Walk up Namsan part 1. A bit further along, looking down a street (below). 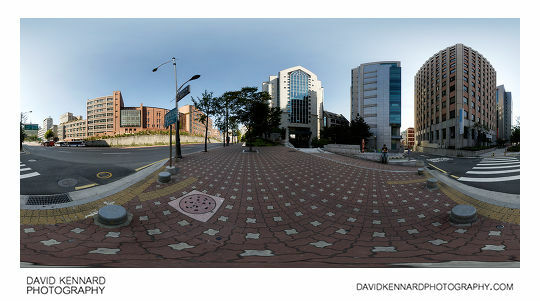 According to google translate the road markings 이바토해 translate to 'Eva vomit'. I'm not entirely convinced that's accurate. 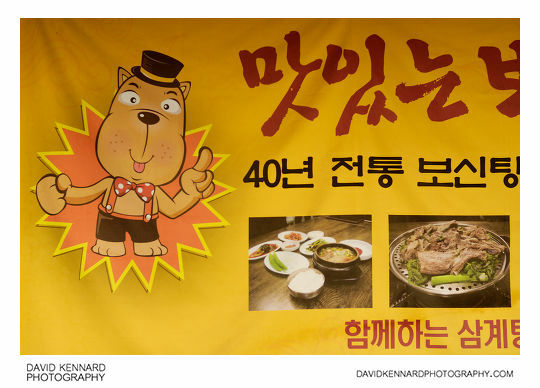 I didn't realise at the time I took this photo, but this banner is for a restaurant offering dishes made with dog meat. I would have been interested to try a dog meat dish, but our lack of Korean (me and my brother had learnt a few Japanese phrases before we left the UK, but didn't know any Korean at all), meant that we tended to stick to restaurants where it looked like they might speak a bit of English. In contrast to Japan, where push/pedal bikes are quite popular, we didn't see many bicycles in Seoul, but we did see plenty of motorbikes and scooters. Modified motorbikes and scooters also seemed to be the primary vehicle used for deliveries. We'd often see them driven along the pavements and across pedestrian crossings, a luxury not afforded to car and van drivers. We didn't see many vans at all in South Korea. 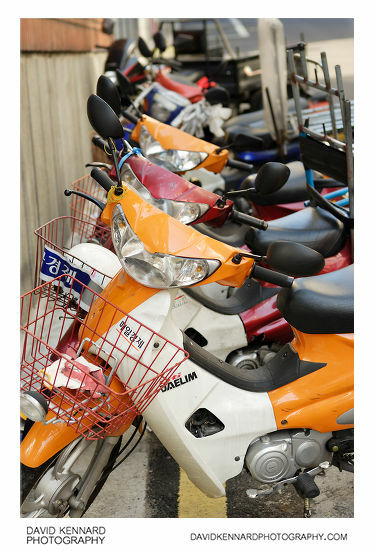 The motorbikes are also much more suited to the relatively narrow side streets in Seoul, down which many businesses are located. Eventually we came out on Samil-ro, one of the main streets in Seoul. 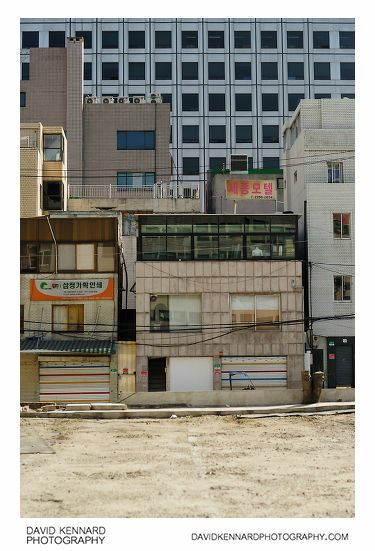 We came out by this large building, which I later found out is the 50th Anniversary Hall of a famous Church in Seoul, Young Nak Presbyterian Church. The actual Church was further up Samil-ro, and we never got to see it during our time in Korea. 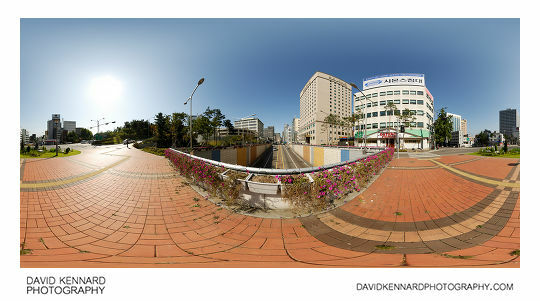 Amongst all the buildings, near the bottom of Samil-ro, just before where it crosses over Chungmu-ro, was this large empty area. I assumed at the time that the older buildings must have been cleared from the area for a new development, but looking at Google Maps, it looks like the area is used as a car park. 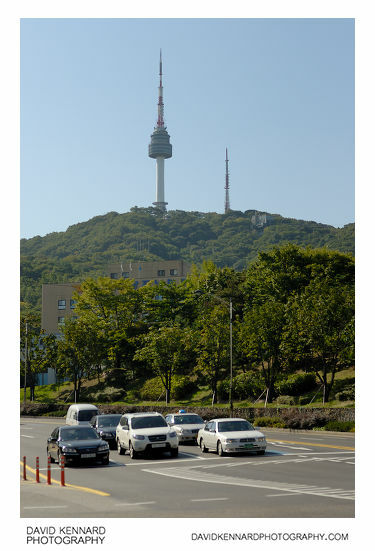 From here we had quite a good view of our intended destination, the N Seoul Tower on top of Mount Namsan. 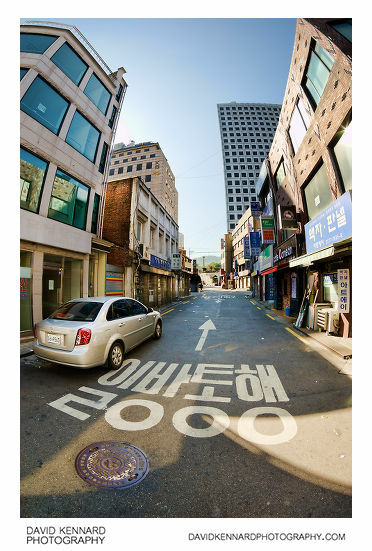 This post might be old but btw, its not 이바토해 with 2000 below, but its 일방통행, which meant ‘one way street’. Thanks, no wonder I couldn’t get a translation of it!